One of my favorite things so far about being down here is the frost. Everywhere you look, everything is coated with ice. Walking anywhere outside, for any length of time, guarantees a nice frosty beard. If you're out for long, solid ice blocks form around your mouth. If you're not wearing goggles, your eyebrows and any stray hairs will frost up. 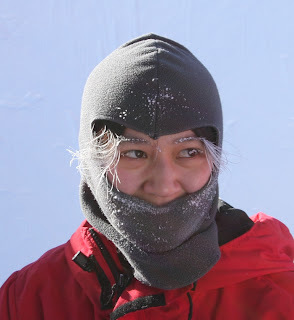 Even your eyelashes will coat themselves in a super-fine layer of ice crystals, which - on the off chance you blink while outside - sometimes fuse together, freezing your eyes shut. There are lots of tunnels which connect the various support structures (power plant, garages, etc) to the station, none of which are heated. People walking through them tend to exhale quite a lot of water into them, which forms spectacular structures of frost all along the walls. While this is one of the driest places on earth in absolute humidity, the air is usually saturated (100% relative humidity), so once ice forms somewhere, it never sublimates away. Anything outside colder than ambient (in a shadow or something like that) will condense water from the air, and slowly but inexorably grow an enormous ice block. The telescope has heaters all the primary mirror to hold it just a degree or two above the air temperature to make sure it never ices up. 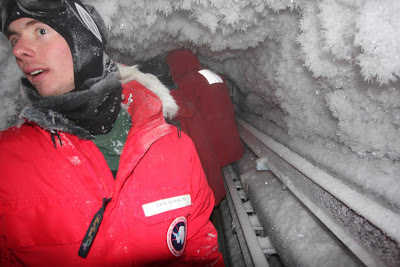 Ice is a big part of south pole life. Speaking of frosty beards, how is yours coming along? Also, what you describe is like my worst nightmare. I'm sure it looks pretty in pictures, though. I always wondered where it is located.